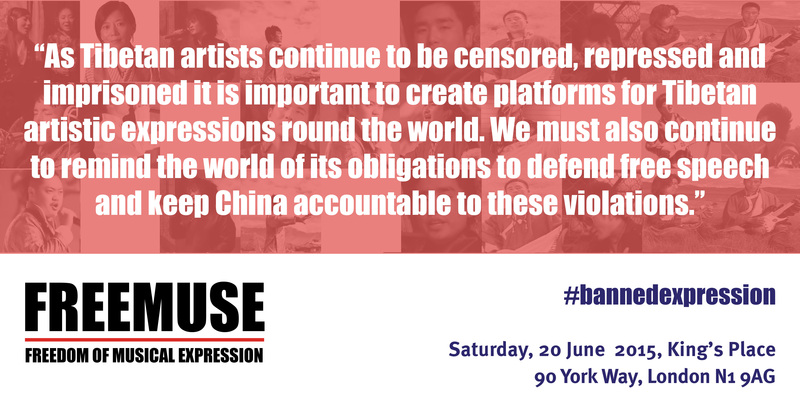 Exile Tibetans based in the UK will amplify the voices behind Tibet’s creative resistance at an event on 20 June called “Banned Expression in Tibet” which will be held at Kings Place. The event will focus on the Tibetan singers, poets and writers who express themselves creatively at great personal risk. Through a programme of live musical performances, poetry readings and short talks, Tibet’s vibrant and defiant creative spirit will come to life. 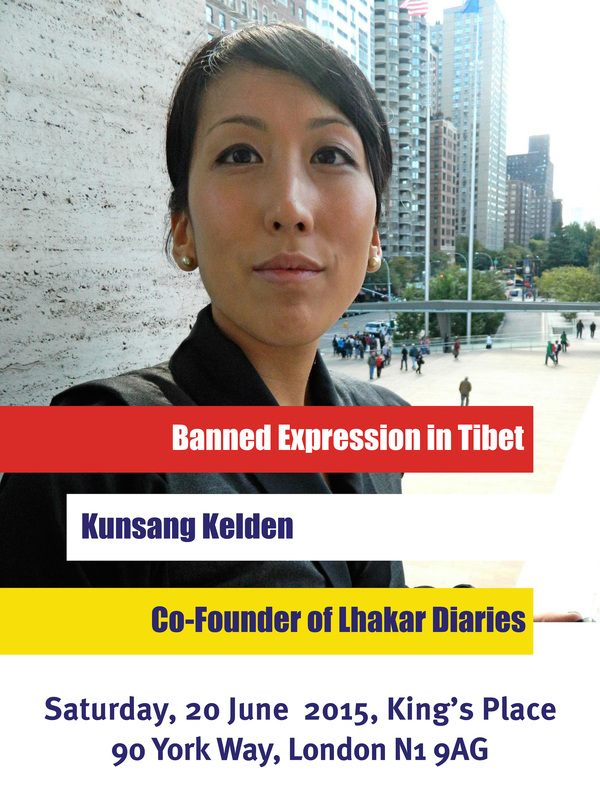 “Banned Expression in Tibet” will be hosted by UK-born Dechen Pemba, editor of the translations website High Peaks Pure Earth, and-US born Kunsang Kelden, co-founder of the Tibetan youth blog Lhakar Diaries. “For the past few years, Tibetan artists inside Tibet have been producing incredibly bold expressions of creative defiance in the form of songs, poetry and writings. It is our intention to amplify these expressions that come at a heavy price in Tibet. We are fortunate here in the UK to have talented Tibetan musicians and performers to support our fellow Tibetans and showcase their work”, said Dechen Pemba. Artists and performers will include Dechen Pemba, Kunsang Kelden, Ugyen Choephell and Youdon Aukatsang. The “Banned Expression” campaign is a joint project of High Peaks Pure Earth, Voice of Tibet and Tibetan Centre for Human Rights and Democracy. 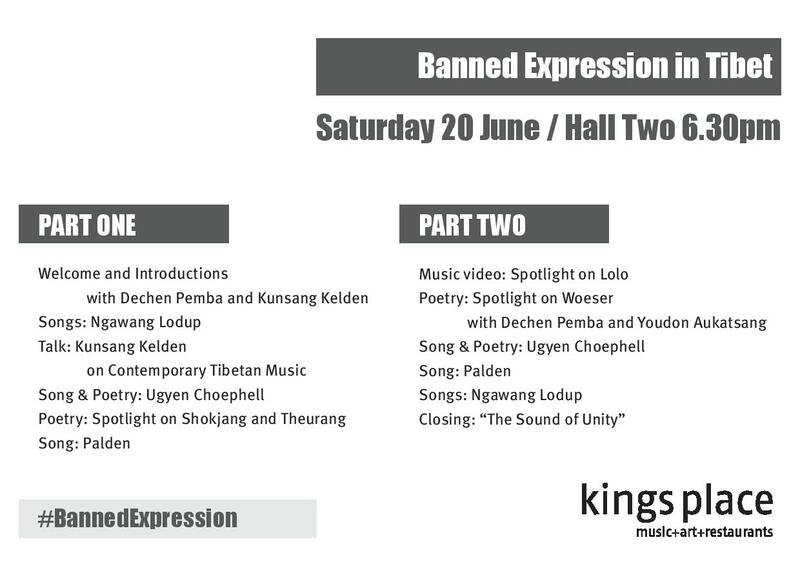 “Banned Expression in Tibet” Comes to London on 20 June 2015! At the end of 2013, the “Banned Expression” campaign officially kicked off with a huge rock concert in Dharamsala, India, by Parikrama, one of India’s most respected rock bands. The campaign Banned Expression aims to highlight the fast shrinking space for writers and artists in Tibet to freely and fearlessly express their views and it is being jointly run by Voice of Tibet, Tibetan Centre for Human Rights and Democracy and my website High Peaks Pure Earth. Artists from all genres: music, literature, film, performance, theatre, painting, photography, etc., will perform, examine and discuss where, how and to what extent constraints are placed on artistic freedom of expression, not to mention examples of the potential of art to challenge established truths and framework conditions. The conference was thought-provoking and led all of us to think about the many silenced creative voices in Tibet, especially after 2008 and what we could do to highlight their words and music. We all went away and did our bit, on High Peaks Pure Earth we started to translate, subtitle and post all kinds of music videos from Tibet and to date have over 50 music videos on the website. In a personal capacity, I started to focus more on Tibetan musical expression and published articles on Global Voices about music censorship and creative Tibetan musical initiatives. For what became the “Banned Expression” campaign, Voice of Tibet and TCHRD did a formidable amount of work, putting together not only the rock concert but publishing a report Banned Expression: Stifling Creativity and Dissent in Tibet and producing a documentary film that premiered in Oslo at the Human Rights Human Wrongs Film Festival in February 2014. You can read all about the events that took place that week in Oslo in a previous blogpost of mine. So… all that brings me to London and Banned Expression as I’m finally putting on an event here on 20 June 2015 at the stunning venue Kings Place. It’s going to be a great night as our team have managed to put together a varied programme that will include live music, spoken word and short talks. The evening will also showcase the best in UK-based Tibetan talent such as Bristol-based Ugyen Choephell who is an artist, musician and poet. Myself and Kunsang Kelden, co-founder of one of the best exile youth blogs Lhakar Diaries, will be the hosts for the evening and we’ll introduce performers and guests who will perform songs from Tibet and read poetry, both in Tibetan and in translation. Among the stifled Tibetan voices that we will highlight are those of prominent Tibetan writer and poet Woeser, imprisoned singer Lolo, writer and poet Tashi Rabten and Shokjang, writer and currently detained. I do hope that many of you will join us next weekend in London. Any proceeds from the night will go to the performers to support their creative work for Tibet. Finally, I’m going to end with a powerful message of support for Banned Expression from FreeMuse and I’d like to thank everyone at FreeMuse for their solidarity with Tibetan artists. See you on 20 June at Kings Place!